"Don't scold me, Livy—let me pay my due homage to your worth; let me honor you above all women; let me love you with a love that knows no doubt, no question—for you are my world, my life, my pride, my all of earth that is worth the having." These are the words of Samuel Clemens in love. Playful and reverential, jubilant and despondent, they are filled with tributes to his fiancée Olivia Langdon and with promises faithfully kept during a thirty-four-year marriage. 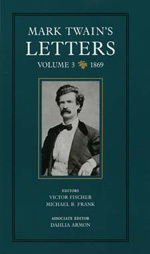 The 188 superbly edited letters gathered here show Samuel Clemens having few idle moments in 1869. When he was not relentlessly "banged about from town to town" on the lecture circuit or busily revising The Innocents Abroad, the book that would make his reputation, he was writing impassioned letters to Olivia. These letters, the longest he ever wrote, make up the bulk of his correspondence for the year and are filled with his acute wit and dazzling language. This latest volume of Mark Twain's Letters captures Clemens on the verge of becoming the celebrity and family man he craved to be. This volume has been supported by the National Endowment for the Humanities and by a major donation to the Friends of The Bancroft Library from the Pareto Fund. Victor Fischer and Michael B. Frank are editors and Dahlia Armon is a former editor with the Mark Twain Project at The Bancroft Library.